Learn how to get some of this star’s impeccable style. Welcome back to Underrated Icons, a column that looks at the styles and influence of icons both past and present who don’t always get the fashion credit they deserve. If I were to ask you to name a fashion and beauty icon with the last name Chung, your first thought would probably be a certain It Girl named Alexa. Who you might not think of is Jamie Chung. With a successful acting and media career behind her, which began on MTV’s The Real World, Jamie has played Mulan on ABC’s Once Upon a Time and voiced GoGo Tamago in Big Hero 6. She is also a fashion blogger at What the Chung? and has collaborated with L*SPACE to design a swimwear collection, Revolve to design a bridal micro-collection, and Banana Republic. She’s also used her fame as a platform to give a voice to the issues that Asian American actors face in Hollywood. This week I’ll give you some insight into Jamie’s trendy but timeless style and how to bring it to your own everyday wardrobe. Keep reading for our guide to Jamie Chung’s style. Jamie’s style is super sleek but also modern. To stay comfy but polished on your way to class, pair a neutral sweater with a classic and edgy leather jacket. Instead of wearing your usual skinnies, upgrade to a pair of raw-hem straight leg jeans and wear it with trendy lace-up flats and a faux leather backpack. Finish with a menswear-inspired accessory in the form of an oversized watch. Jamie’s style is all about combining smooth and simple silhouettes with interesting details and prints. For a more professional (but still cute) look, try tucking a printed wrap blouse into an asymmetrical pencil skirt. To make your outfit a little more modest, you can top it with a neutral colored blazer. Frame your look with pointed heels that are still appropriate for an office environment, a neutral carryall bag, a layered necklace from Banana Republic, and some berry tinted lip balm. Every now and then, Jamie goes for bolder, trendier looks at events like Fashion Week and on the red carpet, while staying true to her personal style and the silhouettes she knows work for her. 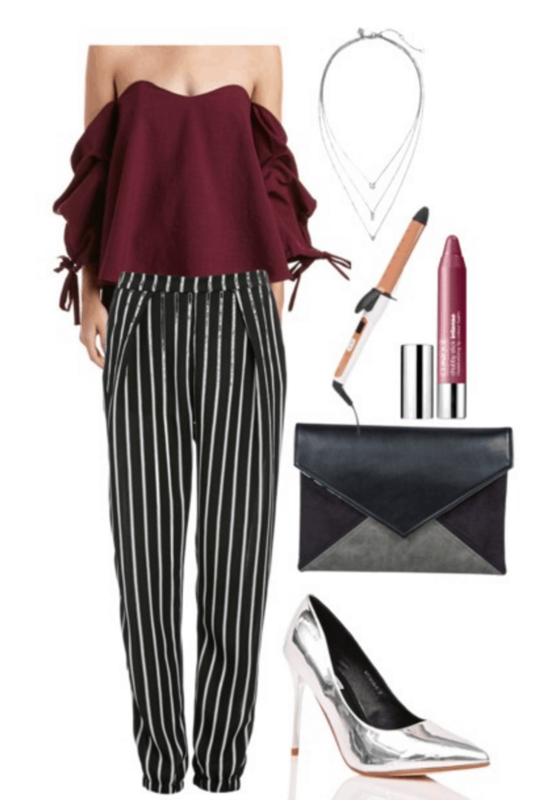 To channel that iconic blogger style, try a balloon sleeve cold-shoulder top with striped trousers. Wear metallic heels and add an envelope clutch to hold your essentials. Jamie is great at reworking pieces for day and night instead of wearing something once for a picture and never wearing it again, so wear the same Banana Republic necklace and tinted lip balm from the last look. To fully channel Jamie’s look, curl your hair into perfect waves and you’re good to go. Did you like these looks? Which one was your favorite? Are you a fan of Jamie Chung? Let me know in the comments below, and of course, if you have any requests, put them down! I may just do it in a future post!